How teams choose to work together can mean the difference between success and failure. The problem is, teams can get side-tracked. Pressures like internal challenges, deadlines, and competing priorities – plus routine fire-drills – can strain connection and drain a team’s potential. And people have different styles – thinking and behavioral preferences that need to mesh on a cohesive team. So often, leaders recognize the missed opportunity of low-functioning teams, but just don’t have a path to fix it. At JERA, we understand the challenges you face, because we’ve been there – in our own careers, and in our work with clients. We know that high-functioning teams are among the biggest competitive advantages an organization can have. Through our process-based approach, we can help to align a team’s true purpose with an organization’s key objectives to build the trust and confidence needed to move forward with confidence. 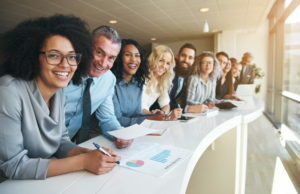 With a common language for conflict and recognition, authentic communication, and more effective and productive relationships, your team can step up to a new level of connectedness, collaboration and shared mission, changing human nature from your opponent into a powerful ally.